When it became evident that those tasked with implementing the plan were uncooperative, the Crimson partners simply rolled up their sleeves and took it on themselves. As Vanstiphout describes, “we had already made the leap from historians to architects, and then we made the leap from architects to developers.” For the past 10 years, they have guided this project through every level of decision-making: from finding investors, obtaining planning permits, consulting with the residents, attending meetings to discuss the heating systems, and even coordinating events in the buildings once they were complete. Vanstiphout’s recent appointment as professor of design and politics at Delft University of Technology (TU Delft), offers him a platform from which to extend this meta-view of the planning and development world. Through an examination of architecture’s changing relationship to politics, power, economics and society, students are prepared to engage these forces of “dark matter” – as Vanstiphout calls them – in a more relevant and engaging way. Rory Hyde: As part of your new appointment at TU Delft you presented the lecture series ‘Blame the Architect?’, examining the ‘failure’ of urban planning schemes of the post-war period. In particular, you researched the riots in the banlieue areas of low income housing on the outskirts of Paris in 2005. What are the lessons architecture students can take away from this? Can we blame the architect? Wouter Vanstiphout: Well with the whole story about the riots, and what I try to give the students there – therapeutically, of course – is a kind of sense of deep desperation and self-doubt, but also a sense of how society sometimes looks at architecture. I often think that architects have no idea what they are being accused of. It’s like Kafka – they have no idea what the charges actually are, but they are serious. But the other side of that story is that I really do not know what my clear-cut position on that question would be; can we blame the architect? Can we blame the type of planning, the spatial qualities, or the ‘added value’ of the architect for at least part of the poverty, alienation, frustration, aggression and crime etc. that has become associated with these types of developments? RH The most damning evidence that you present against architects’ ‘innocence’ would seem to be this incredible observation that the riots in France only occurred in neighbourhoods built in this particular modernist style, from this particular period. A 100 percent correlation between burning cars and Corbusian-inspired high rises. WV Yes, 100 percent correlation. With one exception, well it’s only an exception in the sense that not all high rises had riots. The one city where there was a big ethnic community, big tensions, and a huge concentration of these high rises, there were no problems. Why? Because they were downtown, very close to the centre of the city, interwoven with the social fabric, so they did not feel isolated. So there is a kind of tentative conclusion that I am working on: I don’t think it is the design or the spatial qualities that we added to these places that are the problem, but that these places are still being seen as ‘projects’. What all these areas had in common was that they had been vilified for years already, and all of them had been treated in the press and by everybody as ‘failed’ pieces of the city. And somehow the dominant rhetoric became that we have to ‘solve’ them by demolishing them. I think that the demolition plans of these areas are just as tabula rasa as the principles on which they were once built. The idea to demolish housing projects in order to solve social problems is just as megalomanic as building housing projects in order to solve social problems. So it is not so much Le Corbusier who is to blame, but it is the Le Corbusier in us who is to blame. Because if you say that something is a failed city, it means you can also say that something is a successful city, meaning that you speak about cities as business plans. If it’s in the red it’s a failure, if it’s in the black it’s good. And this is ridiculous! It’s like talking about people as successes or failures depending on how much money they make. RH This reminds me of something you said in a lecture at the Architectural Association: “If architecture can claim to solve problems, then it’s only logical that it can also be blamed.” So you can’t have it both ways. WV That’s right. You can’t say, “I can solve problems, but I’m not to blame if I cause a problem”, it’s impossible. If you can use a knife to cut a steak, you can also use a knife to stab someone. So it’s a choice you have to make, and it’s a funny philosophical choice that architects have never really made. For example, the whole discussion about Robin Hood Gardens, where even Zaha Hadid says, “this is important architecture and we have to save it”. I find this so puzzling, because all these visionary architects said that the architecture could not be blamed for the problems happening in Robin Hood Gardens. So if architecture cannot be blamed, then it also cannot be thanked. And therefore as an architect you can’t claim to create a social transformation through your own architecture. RH Robin Hood Gardens is an interesting example because the Smithsons’ rhetoric was so community-oriented and so utopic, but one which has so radically mismatched the results. So is the lesson then for architects to just be more humble? WV I am seriously and deeply ambiguous about this whole question [laughs]. On the one hand, of course architects should be more humble, but on the other hand if they are humble, what good are they? RH Do you see your work in Hoogvliet, where you have retained many of the existing so-called ‘failed’ buildings, added some new small-scale buildings, all determined by an intimate process of local community engagement etc., as humble? WV I would not say that was humble, and having done that project I don’t think that you can be humble. I think that our project is deeply arrogant – I hope in a good way – in the sense that if you are humble, and if you take this humility to the extreme, it would mean that you would accept everything instead of challenging it. So in Hoogvliet, we would accept that the social segregation was happening and that there was not much you could do about it. When actually we were like school teachers, practically slapping them and ferrying them about. We organised an exhibition and we actually went around with buses and knocked on doors to bring them there. Because we knew that in a society in Hoogvliet people would never go. So we really, literally rounded them up, we forced ourselves on these people. Now I’m from Belgian ancestry, and I nearly felt like one of those Catholic missionaries in Congo, forcing my beliefs on the poor natives! So there is no humility. RH I’m going to quote your essay from the Open City catalogue, where you mention that the status of the architect is now at a high point – Rem Koolhaas, Zaha Hadid, Frank Gehry and Norman Foster have all become household names, gracing the covers of magazines and flying around the world. But you also see this popularity as having marginalised the architect in a way, you say that “to restore architecture and planning to a position where it can have a real positive impact on society may even demand destroying the mythology of the architect as visionary”. How do we reconcile this need on the one hand to make big plans, but also not to be so definitive? WV Well, this was written in the wake of the financial crisis, and we made this kind of analogy between how financial products are being created and sold that have lost any connection with real production or a real economy. And in the same way, architecture has drifted into the stratosphere, where it’s not even as simple as designs being produced which have no relationship to actual buildings, but it’s even that the buildings that are being produced have no relationship to actual needs. Instead, they are being produced for city marketing, or to create objects that investors can speculate in, even – as you know – some of the buildings in Dubai were standing empty and earning an enormous amount of money, just to rent them out would be a headache, as the rental earnings would be so marginal compared to the speculative earnings. Now I think the visionary part of architecture is important, I think there is a real and important role for visionary architecture, but right now, especially that part of it, is completely bankrupt and empty. When an architect now proposes a speculative or visionary design, it does not have the same meaning as when they did it in the 1970s or the 1930s, it has a completely different role, and I think that now in the current environment it has no positive role. RH It’s interesting, I often think about this contradiction in the way we talk about vision. Architects still seem unable to confront the 1970s – it’s a time when our best intentions were revealed to also be our biggest failures. And because of that, we’re also afraid of never being asked to design on that scale again. So on the one hand, the rhetoric at the moment seems to be ‘crisis’ – the financial crisis, the environmental crisis, the crisis of social cohesion, the ageing crisis – but then on the other hand, the greatest solution on the table at the moment seems to be urban farming. So while the challenges we face are at their most formidable, our response is at its most polite. Do you think that is the legacy of the 1970s playing out? A reaction against that hubris? WV I don’t know, maybe this is a more cynical explanation of it, but it seems that the whole idea of the profile of the star architect seems to be shifting from Rem Koolhaas, who is still kind of in the family of Le Corbusier – coolness, shrillness, European-ness, a kind of ‘robot man’, you know, publishing endlessly, opinionated about everything, but also unapproachable – and it has progressed towards Bono. So there seems to be a new kind of player now – Alejandro Aravena is one of them – and I’ve seen it teaching in Delft, where if you want to get all the students behind you, you have to do projects in Haiti, or you have to do self-build projects in the slums of Peru, or urban farming. When I taught in Berlin a couple of years ago, I already saw this happening; architects would say “I am a DJ and we organise parties because that is real architecture”. So that is kind of this legacy of the 1960s, but in a way I find this attitude of the smallness, of the doing-it-yourself-ness not as arrogant but even more vain in a way. So I’m really critical and bordering on the cynical about this current obsession with urban intervention, especially because it’s so globalised. I mean, these people they spend thousands of dollars on flights from Amsterdam to Haiti to work with the people – there’s something really spoilt about it. RH ‘Spoilt’ is a great word. But I have to admit I’ve dappled in this urban intervention myself – although here in Rotterdam, not in Haiti – and it was a great project to do, but I guess the bad taste it left in my mouth was that it was so easy, and yet it got so much attention. We didn’t go through any of the nightmares that you did in Hoogvliet, we didn’t apply for any permissions. We took some great photos, gave away some free beer and got on all the design blogs. And I feel like that is what urban intervention is plugging into, rather than some deeper desire to fix the city, because if that’s what you really wanted to do then you would think on a much larger scale. WV And that brings us to the real design as politics question. If you really want to change the city, or want a real struggle, a real fight, then it would require re-engaging with things like public planning for example, or re-engaging with government, or re-engaging with large-scale institutionalised developers. I think that’s where the real struggles lie, that we re-engage with these structures and these institutions, this horribly complex ‘dark matter’. That’s where it becomes really interesting. For example, now for the International Architecture Biennale Rotterdam, with my chair at Delft, we are looking at two cities – one in the Netherlands and one in Brazil – which want to extend huge highways. In both places you can see that all the architects think it’s a bad idea, the local government thinks it’s a bad idea too, but the state government thinks we have to do it. Left wing people are against it; right wing people are for it. So the interesting thing is to understand that it’s really a political issue – highways somehow are right wing, and houses are some- how left wing – and it really works like that! You see it even in the Netherlands, the capital of consensus – this polarisation in politics cuts straight down the middle. One of the challenges that we have put to ourselves is to ask “does architecture have the power to propose a highway that would even make the left wing parties happy?” And you will not do that by making a compromise. It’s an experiment, I’m not saying I believe in that kind of thing, but I do believe that architecture and design as a combination of pure speculation, rhetorical poetics and technical capacity, could play a role in politics. It could re-shape certain discussions and therefore create its own inevitability. RH Yes, I’ve always thought that the role and the strength of architecture in these debates that become so political is to provide an alternative in order to open up the debate. When there’s just that one design on the table, and one side is yelling “no” and the other side is yelling “yes” at exactly the same level, you’re stuck. But if you can produce this thing that seems to appease both parties, then you can come back to the table. WV Exactly, and I think there is a kind of potential for visionaries in that attitude toward design. RH Aside from highways, have you found that actual buildings can be so politically divisive? WV If it is true, as in Rotterdam for example, that the minaret of a mosque can be the focus of such a huge political effort to ban them, then the way that buildings look does have a political relevance. If people look at minarets in a political way, just as they look at the absence of minarets in a political way, then they look in a political way. When we were developing the design of the Heerlijkheid in Hoogvliet, this is something we were explicitly researching, which is also the reason that we worked with FAT [Fashion Architecture Taste], to explore the capacity of a narrative architecture – an architecture that can express through ornament, the history, the values, the proposed values of a specific place. That being in Hoogvliet this strange combination of the rustic, the pastoral, the industrial and the suburban; the building is loaded with references, even the golden porchway could be seen as a gas explosion or as some trees. I also think there is a connection between the high rises in Paris burning up and the way that they look. But the connection is probably the other way around, somehow these same images have gone from representing a promise to representing desperation. But it’s the same image. And I think it is the same with minarets. If we go to Istanbul we see the minaret as part of a tradition, a history, a kind of ‘orientalist joy’. And yet maybe even the same people who love them in Istanbul hate them here. So I think there is a real relationship between the aesthetics of architecture and politics, but it’s also a relationship that can suddenly switch. So the joyous effect of brutal concrete can flip into blood. RH I recently watched a documentary called The Pruitt-Igoe Myth, which has interviews with the former residents of this ‘failed’ housing project, who describe the joy of having their own room for the first time in their lives; they never dreamed they would ever live in a bright, new, modern building like it. It initially fulfilled all the utopic claims made for it by the architects. The film then goes to pains to illustrate how the architecture was only one pillar of so many other external causes that led to its transformation into a living hell. But the buildings of course get the blame. WV And in a way it’s also understandable that the buildings get the blame, because they are the things you can most easily change. Some of the other factors are so deeply complex that you cannot change them. Another thing we discovered through our research is this kind of controversial idea that democracy and equality is bad for communal housing, because people are relegated there. Whereas at the complete other end of the spectrum, we discovered in cities like Kabul and Tehran, where you have these repressive regimes and repressive religious cultures, that it was the high rises where the secular middle classes wanted to live, because there it was exactly the kind of non-social, anonymous, monotonous, alienating qualities of the high rise that created freedom. If they lived in this wonderful souk of inner-courtyards etc., they would be constantly watched over; the whole social fabric being so dense that they couldn’t be anything else. Imagine being a lesbian school teacher in the souks of Kabul, the architecture then becomes a form of repression. So the whole social fabric and social cohesion of these spaces – especially in a repressive society – can become incredibly oppressive. Whereas the high rises, exactly for the reason that they become a problem in a democratic society, can be a kind of solution. RH It sounds like such a direct expression of this link between design and politics. The design stays the same, but when you change the politics, you get a completely different result. WV Exactly, and that’s exactly the point. So I don’t think architects have to shed their visionary status, their ‘good’ arrogance, or their speculative powers, if only they would realise that things are contextual! Acknowledge the fact that the deepest meaning in what they do is directly related to the context in which they do it. You can draw two lessons from this; either you say “it’s all random, it’s all context, you can’t do anything”, and you’re a slave to context. Which for an architect is a death sentence, it’s very depressing. Whatever you do is irrelevant, it’s all determined by external factors. But you can also draw another lesson – and I hope that this is the real lesson – which is that something that doesn’t work here does work there, and there are real reasons for this. So there are ways to really use architecture to change, to give a real alternative, to have a real effect, to be visionary. Right now the idea to build a high rise complex in the middle of Tehran would be a visionary thing, and if you would do it, it would work fantastically and you would be the world’s biggest hero and rightly so. 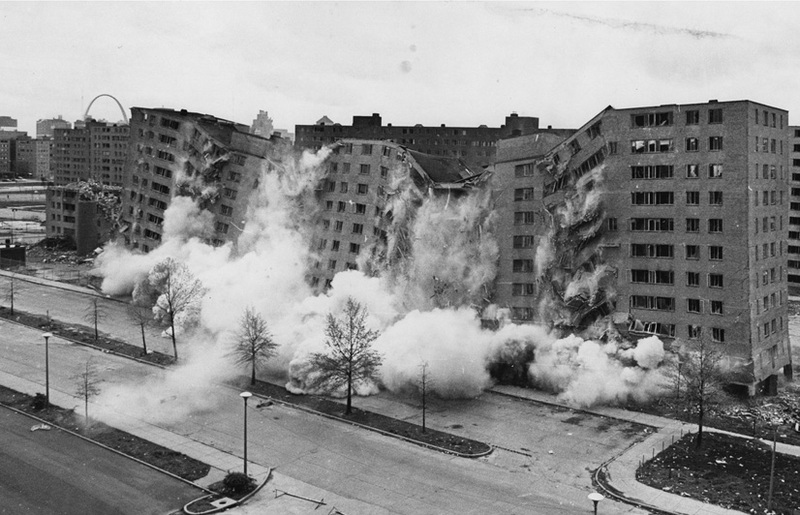 But then if suddenly Iran gets democracy, it might just turn into Pruitt-Igoe! Rory Hyde is an architect and researcher based in Amsterdam currently working for MVRDV. This interview is drawn from his forthcoming book Potential Futures for Architectural Practice. Why is it that even this article returned to the idea of architect as visionary=solutionist? It is not that architects can be helpful in solving some of the problems out there, but there is this recurrent idea that ‘they can’t do it without us’. – Its crude but it describes the dilemma nicely. From reading this brief caption of the Hoogvliet project, one senses that the legitimacy of the project was constituted in its democratic sovereignty, that was forged through the school excursion-style bus trips and knocking on doors and other participation strategies. Not the design vision. The vision in the Hoogvliet project seems to be what drove Crimson, not the residents or policy makers, who were driven by feet (wheels) and hands and action. Would we then not actually open up a concept of future architectural practice that is as equally action-orientated as visionary? That is about enrolment?